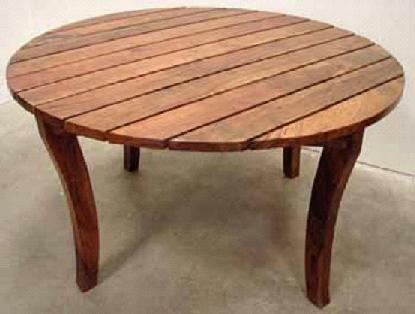 Outdoor Round Table in weather-treated encino wood. Perfect for your Mexico patio or recreational space. ENCINO Wood - Outdoor Round Table. 54'' Diameter. A perfect complement to your Mexican patio, recreational or outdoor areas. Seems poised and ready to entertain! Beautiful red-tinged and weather-treated wood adds warmth, durability and character.